Directed by: Charlie McCarthy, Produced by: Wildfire Films, Ireland, S1 6×25′ S2 6×25′, 2013, Comedy/Politics, Rights: World except Ireland. The first season is a fun, sharp, satirical comedy where the half-baked Irish-language quango ACT is threatened with cuts due to the financial crisis. Caoimhe the new minister in charge of cutting costs and Setanta the inept director of ACT (The Language Council). Setanta is a mild-mannered man who has always believed in the path of least resistance. A mediator par excellence who has got where he is by keeping his head down. But now, in the downturn, ACT has come under scrutiny and threat of closure. The appointment of a new minister who went to school with Setanta and always disliked him makes matters worse. Setanta and his team push the various projects they’ve been funding into the spotlight in an effort to justify their existence. The projects range from intense young filmmakers to passionate promoters of the Ulster-Scots language and culture to very unorthodox GAA all stars and volatile sean-nós singers. Throughout it all, Setanta struggles manfully to hold it all together helped, and more often hindered, by his staff and the cultural sacred cows they have chosen to fund. The second standalone season is set at the EU headquarters in Brussels. Maeve Kelly Clarke (Bláthnaid Ní Chofaigh) is a self-important and brazzy politician, cut from blue-chip, Irish political stock and she is on her way to represent Ireland in Brussels. 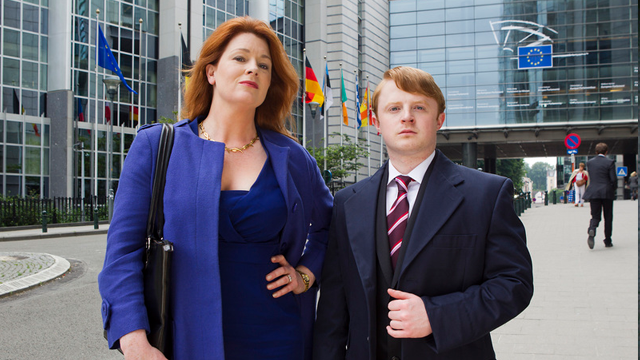 It takes a swipe at EU bureaucracy, Irish political dynasties and Ryanair. Maeve Kelly Clarke is cut from blue-chip, Irish political stock. Her father, her hero, was a TD and she’s on her way to represent Ireland in Brussels. Maeve inherited Daddy’s political ambition, ruthlessness and cunning and she’s going to need all of it when she lands in EU Headquarters. With an eccentric and increasingly luckless team surrounding her, Maeve’s determination to prove herself to her European colleagues, as well as her Irish detractors, suffers repeated setbacks. Low-cost Irish airline, Doyleair, prove to be very high-stress. Maeve is made to suffer for an Irish artist’s lefty political tantrums. Belligerent German pensioners, a nosy documentary crew and a Eurovision-loving Irish Taoiseach all threaten to derail Maeve’s Euro’ experiment. If that isn’t enough, Maeve’s Chef De Cabinet, Ciaran MacIonraic, brings his own unique brand of chaos and disorder. But Maeve Kelly Clarke didn’t get where she is today for no reason. Like her father, Maeve’s a fighter and if anyone’s going to be an honorary mother to 500 million Europeans, it’s this unique Irish woman.